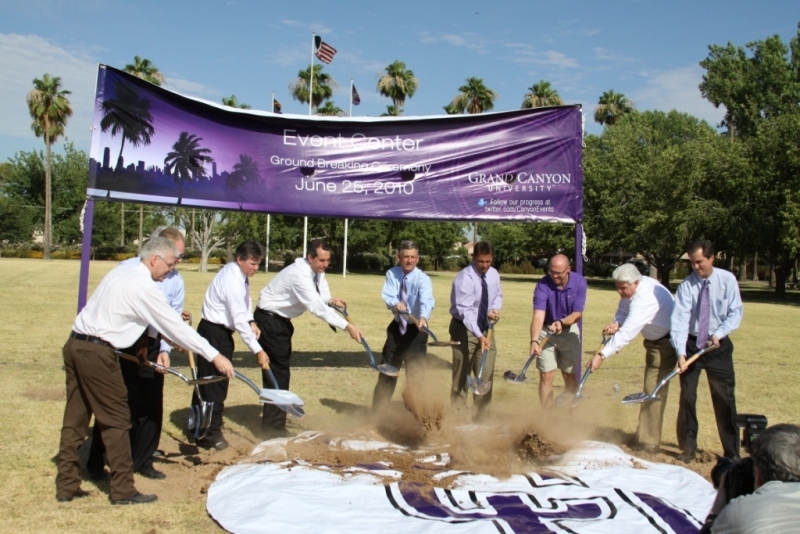 One year ago Saturday, more than 300 GCU employees and guests assembled on a grassy plot on the southeastern corner of campus, the site where a new Event Center would be built. The groundbreaking took place on a sweltering, 92-degree morning, with a large tent providing only temporary relief. A year later, it’s similarly hot — the temperature exceeded 110 degrees this week — but everything else has changed, including the facility’s name. The tent is long gone, replaced by what soon will become the new face of west Phoenix. 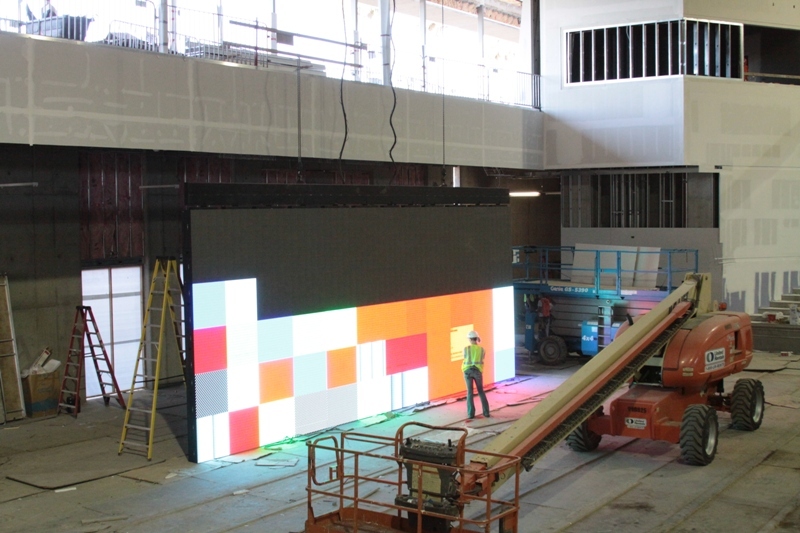 Grand Canyon University Arena is slightly more than two months from opening, and the University and contractor agree that the project couldn’t have gone any better. Aside from a mix-up last week involving the delivery of the Arena’s seats, “there haven’t been any big surprises,” says Bob Machen, GCU’s vice president for campus development. Irwin Seating Co. mistakenly shipped 3,900 gray seats and 200 purple seats — the reverse of the order that had been placed by GCU. The gray ones are designed to form the letters G-C-U embedded in cutout areas on either side of the seating bowl, clearly visible when the Arena is empty of spectators. Machen says the seating should be completed by Aug. 12, but plenty will happen between now and then. The large scoreboard was installed at the south end this week and was tested for the first time today. By the end of next week, the building will be sealed to the outside and the air-conditioning system will be switched on. By July 14, all exterior glass work will be done. And by the end of July, the hardwood basketball court will be installed. 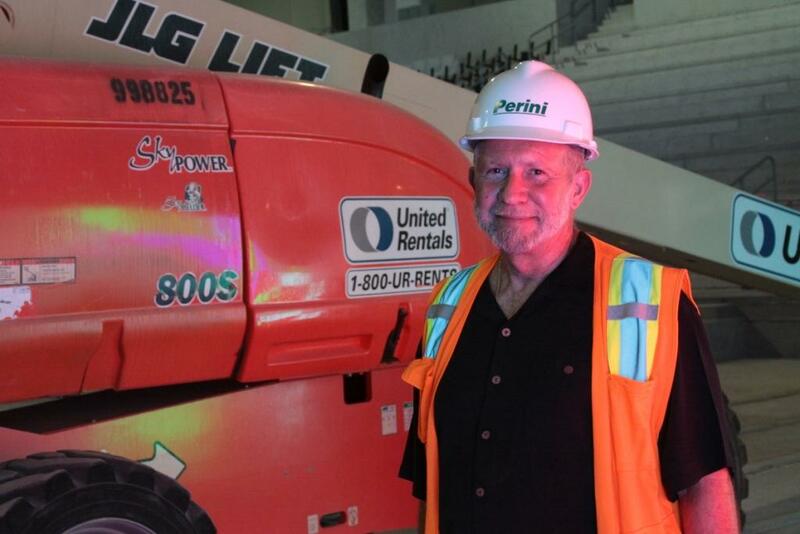 “Between July 11 and 25, the entire building will come alive,” says Superintendent Neil Baker of Perini Construction. “The power and alarm systems will be activated in that time period. According to Baker, the structural work and waterproofing are “98 percent complete.” He says the crew working on the Arena peaked at 150 in number during February and March, when both structural and interior work was being done. Over the course of the job, about 500 workers have been involved. Machen says he has followed many of the same procedures he used in overseeing the construction of US Airways Center (then America West Arena) for the Phoenix Suns 20 years ago. A big difference, of course, is that GCU Arena hasn’t been his only project over the past year. Since last June, the University has opened a second dormitory (Canyon Hall, in August), the Student Recreation Center (in October) and the College of Education classroom building (in January). A third dormitory (Prescott Hall) and a food court (Thunder Alley) will open at about the same time as the Arena, when students return for fall classes. The start of work on a fourth dormitory (Camelback Hall) and a College of Arts and Sciences building won’t be far behind. This year is significant in several ways for Machen, who was hired by the University two years ago after a long and distinguished career as Jerry Colangelo’s right-hand man with the Suns and Arizona Diamondbacks. In July, he’ll celebrate his 40th wedding anniversary and 30 years as a Christian. Around Aug. 1, he expects to be in his new office in the Arena. And he’ll turn 70 in September. Job walks at GCU Arena will take place at 3:30 p.m. on July 5 and Aug. 2, for those interested in seeing construction progress. Email events@gcu.edu to reserve a place on the tour.